Why would you have the president in your sights, are locked on to him, and not shoot? If this is a serious coup attempt, one of the first things that is done is the capture or killing of a leader. 2. It was reported on July 17, 2016 that due to the attempted coup, a little over 2,700 judges were dismissed “along with several members of the council itself.” That’s a large amount of judges and it seems rather strange to have the coup first be reported on July 16, 2016 and literally the day after suddenly have over 2,000 judges that you want dismissed. This is further backed up by EU commissioner Johannes Hahn, who is dealing with Turkey’s EU membership bid. He has said that the swift rounding up of judges and others indicates that the lists were made beforehand. 3. The coup plotters had no media presence and did a horrible job of shutting down communications and promoting their own agenda via television and the internet. That’s a special kind of incompetence. 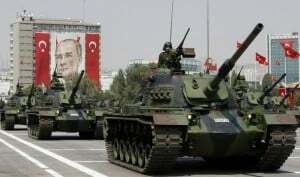 So, due to Erdogan and his Justice and Development (AKP) Party controlling Parliament at that time (and currently have majority rule today due to winning elections in 2015), the judges on the Constitutional Courts would be hand-picked by the President and his party allies and thus could very well hand out rulings that would harshly punish any those military officials who plotted a coup or engaged in a coup attempt. Now, the President has tried to push the blame onto Fethullah Gulen, who is in a self-imposed exile, having left Turkey for the US in 1990 during increased legal action against Islamists. Gulen heads the Hizmet movement, “a moderate, pro-Western brand of Sunni Islam that appeals to many well-educated and professional Turks” and has established a number of NGOs that are credited with helping to address a number of Turkey’s social problems. In the recent past, there been strife in Turkey between the Gulenists and Erdogan supporters within the state bureaucracy. In late 2013, “law-enforcement and judicial officials thought to be loyal to Mr. Gulen went on an anti-corruption drive against people close to Mr. Erdogan, targeting one of his sons as well as several ministers,” but the very next year, Erdogan struck back hard, “purging thousands of police officials, prosecutors and judges suspected to be linked to Mr. Gulen.” So, there is some basis for there to be suspicion of him. However, only ten percent of Turkey’s population, or about 7.5 million people, are supporters of Gulen. It should also be noted that this was a military coup and the military has historically been an enforcer of secular rule. Thus, it is rather questionable if the Gulenists are behind the attempted coup. A coup attempt would aid Erdogan, who has been moving for quite some time to consolidate his own power amid recent low popularity, as it would allow him to gain even more power and maintain his control on the state. More information is still coming out and at the end of the day, only time will tell if the coup was a false flag or not, however, it would be wise to remain skeptical of what is coming from the Turkish government and to keep an ear to the ground.